There are many historic warships that survive as “floating museums,” but none of them has the pedigree of the USS Olympia. The Age of Fighting Sail and World War II are well represented in this museum fleet, but what about the Spanish-American War? The U.S. fought Spain over 110 years ago, ostensibly over the USS Maine explosion, but really for a desire to seize territory and expand America’s influence overseas. It was also a complete cakewalk; more soldiers died from malaria than from enemy fire. The Spanish-American War was like the Guilded Age version of Desert Storm. The only difference was that, instead of cruise missiles, the high-tech showpieces were armored battleships and cruisers like the Olympia. She was the flagship of Commodore George Dewey at the Battle of Manila Bay, where the U.S. fleet sank or captured its Spanish counterpart without any loss of life. Six days later, when news of the battle reached the U.S., Assistant Secretary of the Navy Theodore Roosevelt headed down to Texas to join a cavalry regiment. That is a battle worth remembering. 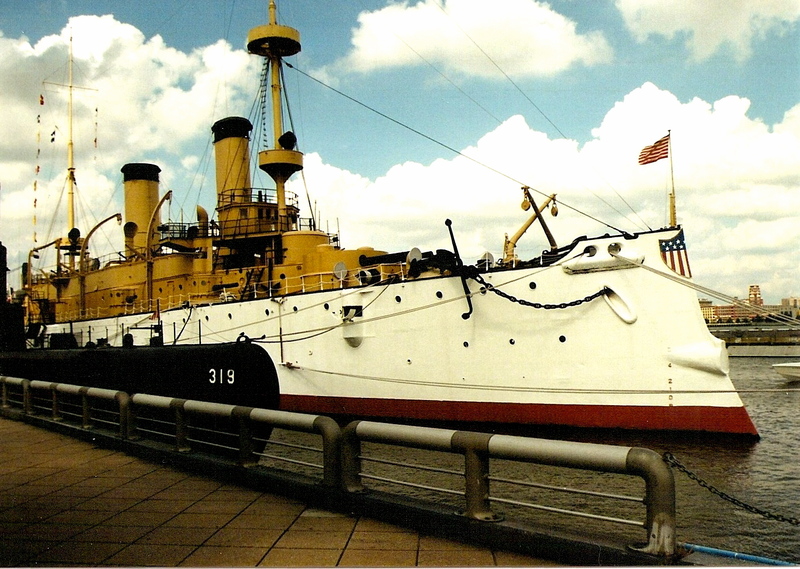 Today, the Olympia is moored at the Independence Seaport Museum in Philadelphia, along with the submarine USS Becuna. Olympia is the only vessel from the Spanish-American War still afloat, and consequently you’ll never see another ship quite like her. She may have been the most powerful ship in the U.S. fleet in 1898, but Olympia looks like a toy compared to modern warships, or even the WWII-era USS New Jersey, which is moored across the river in Camden. Olympia wears white paint (in wartime she would have worn gray) with a U.S. shield on the bow, a scheme meant to impress foreign dignitaries. Also meant to impress foreign dignitaries are the six-pounder guns sticking out of Olympia’s flanks. There is no gun deck; several of the guns are mounted in the wood-lined officer’s mess, where diplomatic negotiations would take place. In fact, the Olympia looks like a child’s drawing of a battleship, with guns coming out of everywhere. It’s much cooler looking than the sleek and stealthy look of modern warships. Unfortunately, like many historic artifacts, the Olympia needs help. She was stewarded by the Independence Seaport Museum and Cruiser Olympia Association for decades, but the cost of maintaining a 100-year-old construct of steel and wood that floats on water were too much. I visited the Olympia several years ago and, while she was a beautiful ship, she was also in need of some repairs. Now, she is also in need of a new home. After failing to come up with $10 million needed for stabilization work, the Independence Seaport Museum decided to give up the Olympia, and is currently trying to transfer Dewey’s flagship to another museum. As of November 2011, four groups were in the running: one wants to keep the ship at its current location, another wants to move her to Beaufort, South Carolina, and a third group wants to set up a museum in Washington, D.C. Mare Island Historic Park, located at the old Mare Island Navy yard in Vallejo, California, also wants the Olympia. Regardless of where she ends up, the Olympia deserves some attention. The USS Constitution (“Old Ironsides”) and USS Missouri (the ship where Gen. MacArthur accepted the Japanese surrender) have become national shrines, but we wouldn’t have gotten from one to the other without the Olympia. That ship and the war it fought in brought America onto the world stage as a military power. History is important because it tells us where we have been, but we need the whole story. For updates on the Olympia preservation effort, click here.